Keystones Elements contain 42 to 50 percent pre-consumer recycled material. 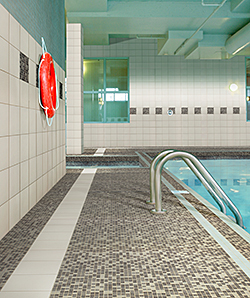 The field tile line in 1-inch by 1-inch mosaic blends is offered in a cool gray color palette (Cloud, Smoke, Storm, Gravel, Ash and Charcoal) and is suitable for indoor or outdoor application, including pool decks. Wet, it has a coefficient of friction of .60; .70 when dry.